Share the story of your favorite collectibles with family and friends. 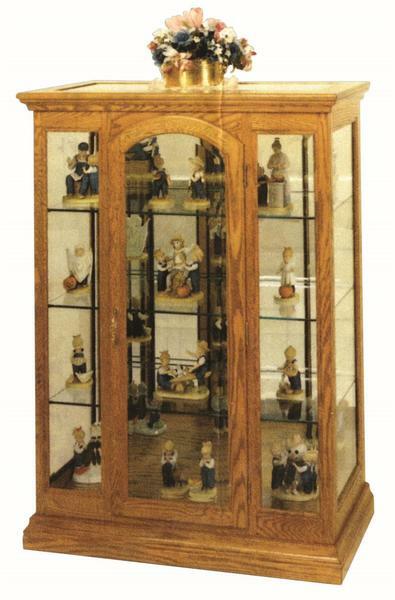 The Amish Small Mission Curio Cabinet offers just the right spot to showcase your treasures. This mission style curio cabinet creates a warm display with its simple design and its presentation of solid hardwood. Mission style furniture incorporates the use of straight lines and flat panels that accentuate the grain of the wood. This appealing design style remains popular throughout the years. Combined with the strength of Amish craftsmanship, this mission curio cabinet will serve your family for generations. This Small Mission Curio Cabinet is shown here in walnut wood. Walnut is a dark wood that displays occasional knots and adds an elegance to any room it is used in. Create the curio cabinet you envision with your choice of solid wood. This mission curio features adjustable glass shelves to accommodate larger items as well as a mirror back to add depth. Review our collection of Amish Curio Display Case Cabinets to find the one you like best. Take a look at our blog post, "Curio Cabinet of Curiosities," for more information on curio cabinet styles.